Posted on January 10, 2013 by All Of Your Beeswax Tagged Apple Cider VinegarBaking SodaEconomicEnvironmentally FriendlyNo 'Pooshampoos and conditionersvinegar and water	Comments2 Comments on No ‘Poo for a New You! No ‘Poo for a New You! This is likely going to be the tide dividing post for most of you. It was all fun and games until we told you to stop using shampoo and conditioner. Homemade lotions: delightful! Borscht: delicious! No shampoo/conditioner: what kind of granola crunching freak do you take me for?! I can almost promise you that once I am done with you, you will get on the no ‘poo train immediately and NEVER LOOK BACK. Or try it, decide that it’s not for you and get back on the train to Shampooville. No judgment here. Ok. A little background on the No ‘Poo, it basically consists of three things: Baking soda, Apple Cider Vinegar and Water. 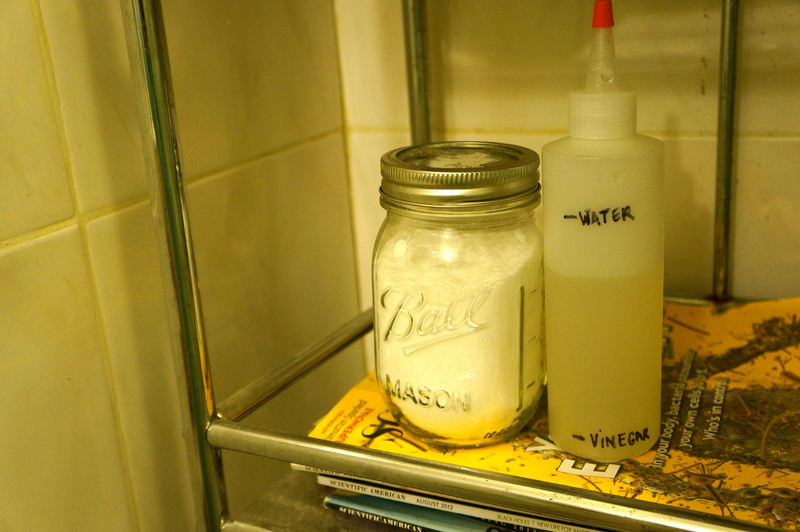 The idea is that baking soda is mixed with water and used as “shampoo”, and a dilution of apple cider vinegar and water is used as “conditioner”. Lather. Yeah, say goodbye. Also you probably would want to say goodbye anyway if you knew why your shampoo lathers. Froofy (should be a word, you get me) smelling shampoos and conditioners. Those artificial scents are lovely, and addicting, but they don’t really last through the day, and they are also achieved by a bevy of nasty chemicals made by poor souls who have likely lost all olfactory perception. The respect of your roommates and or significant other. They will scoff, they will puzzle, but you can just sit them down and say: “it’s not you, its shampoo”. They will learn to deal, and who knows, perhaps you can even convert them in time. Now you may be saying to yourself: but Ashlee, I don’t want to smell like a pickled egg all day. Really? I mean, I do. But I don’t and neither will you. The vinegar dilution obviously smells like vinegar while you are applying it. However, it quickly dissipates once you rinse it away and as your hair dries. Nobody has to know, unless you want them to of course. In which case, say it loud and proud hero. You have shorter hair and use approximately ½ tbs per shower. You shower/wash your hair everyday. If this doesn’t apply to you, you can extrapolate from the following information. So let’s just say you buy a 10.1 ounce bottle of shampoo and conditioner at $4.50 a pop. 10.1 ounces contains approximately 40 washes, or a little over a month of everyday washing. This means that over the course of the year, you would spend around $108 on shampoo and conditioner. One 16 ounce package of non chemically treated baking soda (like Bob’s Red Mill), costs about $3.30 (mind you all of these are estimates and far cheaper if bought online). One package of baking soda will net you about 64 shampoos or around 9 weeks worth of everyday washing. One 32 ounce bottle of organic apple cider vinegar will cost $6.70 and net you a whopping 64 weeks worth of conditioning, or 16 months worth of everyday washing. Now this means that over the course of the year, you would spend roughly $27. That is a savings of $81! Which over a ten-year period is over $800! Shoot girl, treat yo’ self. Water: Over 80% of your $4.50 is just plain ol’ h20. Surfactant: A detergent that cleans by trapping dirt and oil so they can be rinsed away. Foaming Agents: Fancy chemicals like cocamide and coamidopropyl betaine. And guess what, these chemicals do ABSOLUTELY NOTHING, save for providing us with the lather that we the consumer, expect. An Acidic Ingredient: Sodium citrate or citric acid is used to maintain the proper pH level in the shampoo. Silicones: Polymers that coat the hair to create shine and smoothness. I dare you to look at the Wikipedia page for silicone. Yeah, that photo is gross. Polyquaternium: Say what? This acts like a fabric softener for your hair, depositing conditioner and fighting static. Pathenol, Fatty Alcohols, and Nut Oils: Used for moisturizing and locking in hydration. Midazolidinyl Urea, Iodopropynyl, Isothiazolinone, and Sodium Benzoate: My spell check right now is like, “WHY ARE YOU DOING THIS TO ME?! “Anyway, these are all preservatives that keep your shampoo from growing mold or bacteria. I’ll spare you, and my spell check all of the ingredients in conditioners, but they mostly contain a mixture of moisturizers, lubricants, and oils all with a lot of “z’s” and “x’s”. Then of course your have your colors and fragrances. No matter how shampoo companies try to market, they are all basically the same. Why are some shampoos $4 while others are $14? A really good branding company, that’s why. Now I’m not going to delve into all of the harm that many of these chemicals may cause, BUT, I have found a very well researched thesis that does address many of these issues. Light reading? No. Informative? YES. The basic principle is that the baking soda and vinegar routine achieves all of the same outcomes as traditional shampoos and conditioners, just without all the extra stuff. There are some people who rally (quite vehemently) against this method citing that since the pH of baking soda is so high, it actually can cause damage to hair and bring about breakage. Which yes, if used on it’s own, probably would. Which is why you should use it in conjunction with the apple cider vinegar, which not only conditions but balances the pH down to a safe level as well. Furthermore, you have to find a routine and combination that works for you. And remember that your hair and scalp will have to adjust to these changes. And I urge you also, not to just take our word for it. Do the research, and decide if you think it might be for you. Cristiana has been on this train for far longer than I have, and has sworn by it for years. I on the other hand, am new to it, but so far, so good. We do recommend combining it with other once in a while hair treatments in the form of oils and or masks (I made one the other day using one egg, one teaspoon of honey and ¼ teaspoon apple cider vinegar). This recipe was for a facial mask, but I thought, what the hell, lets slather it on the head too. Needless to say, it was great for both. Plastic bottles take more energy, chemicals, and oil to make and ship. Glass, and paper packaging while still obviously need to be shipped use far less harmful chemicals and energy to produce. Furthermore, they are more easily recycled and reused. And that’s just the outside of the bottle. What about the inside? Well, all of those Z’s and X’s aren’t great for the planet either. The Environmental Working Group developed a website called SkinDeep. In which they have compiled a vast database of cosmetics and personal hygiene products, and given each product a rating. The ratings range from low to moderate or high human/environmental hazard. You can search for products and see where they rank, and which ingredients are of concern and why. While this website is primarily used to show the impact on humans, it’s not hard to extrapolate from the information onto a larger picture. If the products and chemicals are harmful to us, I’m pretty sure it’s safe to infer that they are not great for other animals and plants as well. Are you so sick of me yet? Phew, anyway. I think I am about done here. Once again, with this and any of our posts we just want to present you with facts, science, and healthy alternatives to the norm. Giving up shampoo for no ‘poo might not be for yoo (I AM LIKE DR. SEUSS). However, if any of these other reasons struck a chord with you, perhaps you can investigate other ways to make more natural choices for yourself and the planet. Also, saving a boatload of money is also nice too. Times are tough ya know? While Cristiana and I both have a no ‘poo routine, we do thing a little differently. For one, she has long hair, I have short. She doesn’t shower/wash her hair everyday, I do. She is a nurse who, through the course of her career, will likely have to take blood from countless patients; I would literally vomit everywhere and black out. So you see, we’re different! 1 squeeze bottle of diluted vinegar and water (with the ratio marked on the bottle for easy refilling) Ratio: 1 tbsp. apple cider vinegar to 1 cup water. Once hair is wet I scoop out half of a tablespoon of baking soda into my hand and mix with a little bit of water. From there I apply it to my head, scrub it into my scalp real good like, and rinse. As for the vinegar, I just squeeze it over my head until I am satisfied. It feels like a lot more than it probably is. I likely use about ½ a tablespoon to 1 tablespoon at a time. Once I’ve applied the vinegar I give it a good rub in and then rinse off. Cristiana uses pretty much the same method. However, she has been doing things for longer, and just eyeballs it. Full disclosure: I’m a bit of a measuring freak. I measure EVERYTHING. When I watch cooking shows and they “eyeball” tablespoons of liquid I die a little inside. Anyway, before getting in the shower, she scoops about a tablespoon of baking soda in a jar and brings it in with her. When ready to wash her hair, she mixes it with water until it looks like watered-down milk, pours it on her head, scrubs it in, and rinses it out. Concentrate on massaging it on your scalp; the mixture cleans the rest of your hair well by just running through it as it rinses out. Then she uses the same jar to add a splash of vinegar, adds about a cup of water to it, pours it on her head, makes sure all hair is saturated, then finally rinses it out. A few things to keep in mind: if you don’t want your baking soda to accidentally come in contact with water, leave it somewhere near the shower where it is within reach but not at risk for becoming inundated with water. Also, organic apple cider vinegar should be kept refrigerated once it has been opened. I leave my dilution for the week next to my shower, but keep the rest refrigerated. If you’ve made it this far in the post, congratulations! You’ve won! We hope to have at least tickled your curiosity. Give the no ‘poo a try sometime! Also, if you come up with a more attractive name for no ‘poo, you should really trademark it immediately, because let’s be honest, it’s kind of a gross name.